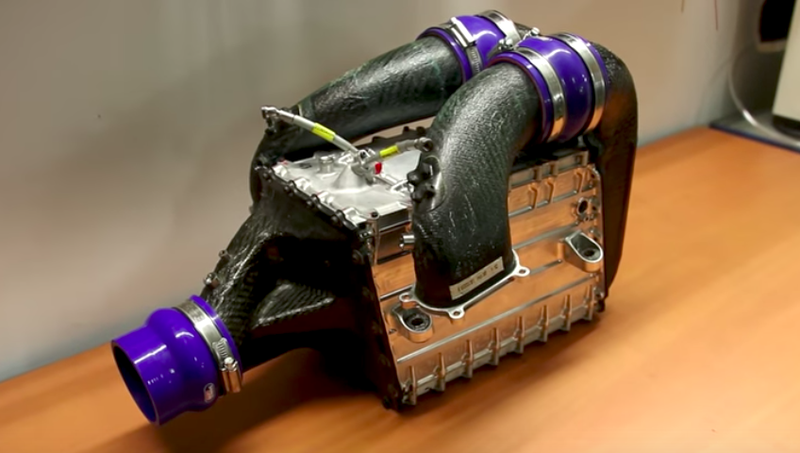 Manor Formula One racing team recently sold off a bunch of its crap in an auction, and YouTuber Peter Bjorck managed to snag a bit of advanced Ferrari engine tech: namely an intercooler he planned to install into his Lamborghini. Here’s a look at the innards of that liquid-to-air Masterpiece Of A Heat Exchanger. The great thing about Formula One cars is that pretty much every single part on them looks ridiculously badass, and when you dismantle each part and look closer, the smaller bits of that badass-looking part almost always look as if they’d been beautifully machined by the fabricating gods. Watch the entire video above to see more of the shiny, beautifully machined Formula One intercooler. Sure, it’s just a small piece of a highly complex Formula One car, but it’s still a beautiful bit of hardware. Plus, it’s always a treat to get an up-close look at a Formula One part that probably cost more than most cars for sale on Craigslist.